The Club listened to our feedback and are attempting to provide us with a new Salvo build. “For Salvo, we tried many different combinations rather than a straight up repaint. After reviewing some of your suggestions, we’ve selected another option to show you a new figure build before we have final feedback on tool availability. Let’s hope we get this version! 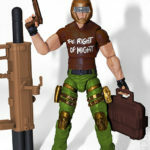 The GI Joe Collector’s Club has just posted up another image of an FSS 5.0 figure, this time, Salvo. Well-versed in anti-armor weapons, Salvo doesn’t trust high-tech, electronics-assisted weapons systems, believing their complexity just leads to an unreliable weapon. He prefers using large amounts of conventional firepower to overwhelm an enemy. After years in the Army, Salvo joined the G.I. Joe team. 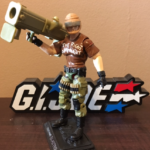 Check out the awesome G.I. Joe Modern Era Salvo Custom by francis2064 after the jump. The Right of Might! Hisstank.com forum member nirvana7 recently posted up his custom Ultimate Salvo..and wow, this figure is an absolute home run! 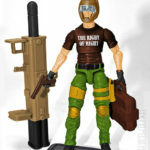 Nirvana7 was waiting for a modern Pursuit of Cobra or 30th style Salvo figure, but as you may know, the only Salvo offering in recent years was the figured offered through NJCC at the show. As such, he took it upon himself to create his own and thankfully he did! 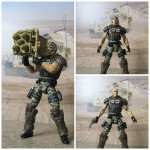 This modern update of the 1990 G.I.Joe Anti-Armor Trooper is one that I’m sure we’d all love to add to our shelves . Salvo comes complete with his signature Missile Launcher and upgraded armor that makes you wonder if this is even a custom at all, as it can easily pass for a production offering. You can check out the parts list used and more images (of course!) after the jump.